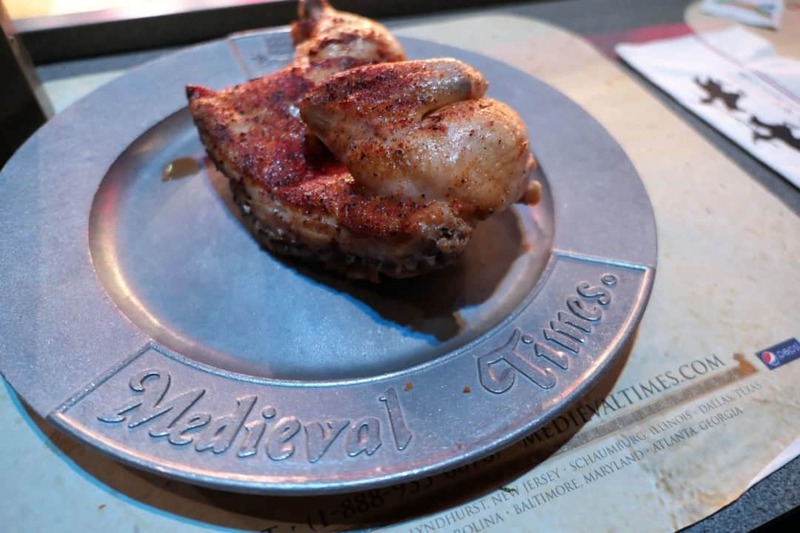 Medieval Times, a family dinner theater experience, transports you and your family to the time of knights, lords and ladies. 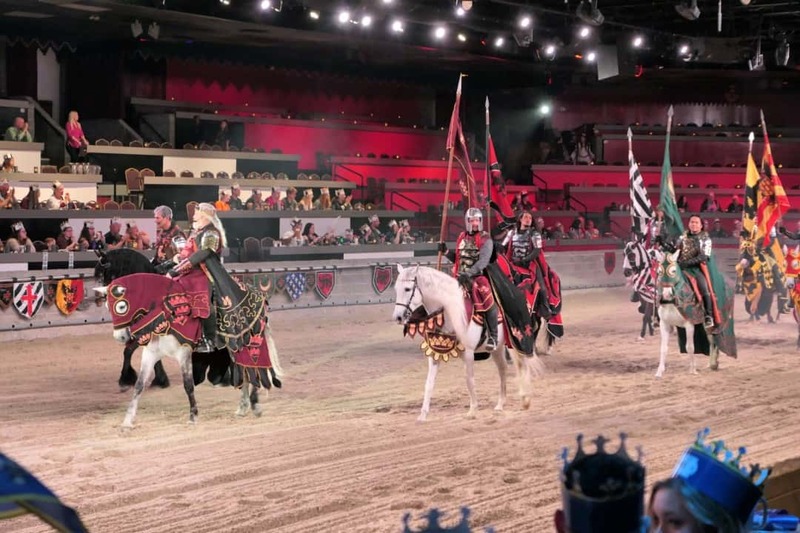 Be the King’s guest and watch six knights duel in a variety of tournament sports including jousting, sword fighting, horse dressage, while you enjoy a four course meal. Depending on the time of year and location, Medieval Times can sell out, so it is best to make reservations in advance. When you book online also look for discounts. There are discounts offered throughout the year. You can also celebrate your birthday for free and get additional discounts by signing up for promotional emails. There are several different ticket packages offered that include perks including preferential seating, a banner to wave to cheer for your knight, and a framed entrance photo of your party with the King. Check out all the different options by clicking here. My family had general admission tickets and had great seats. It was suggested that we arrive no less than 45 minutes prior to our dinner show time. The horses from the show have a large pasture that you pass as you drive into the parking lot at the Medieval Times in Myrtle Beach. I saw several families watching the horses and taking pictures. The castle entrance is a great back drop for photos. After taking some pictures we were welcomed at the door by an attendant, and then checked in for our reservation and assigned a table number and colored knight to support. Everyone in the family got colored paper crowns that matched our knight which we all wore for the entire evening. After taking a celebratory photo with the King, we moved into the great hall to wait to be called for dinner. In the hall you have to opportunity to purchase banners to support your Knight, lighted swords and souvenirs. You can also buy beer, wine and non-alcoholic slushies in a variety of flavors to drink while you wait. At the far side of the hall there is a short dungeon tour you can take for $2.00 per person. There are signs that warn families with young children that there are models of medieval torture devices on display. However, the descriptions of how each device was used are written and I didn’t see any pictures that showed an example of torture being performed on a person. My almost eight year-old was not scared, but younger children may be frightened. This time is also a great opportunity to visit the bathroom. The show is a full two hours long and there are periods of darkness which could make it difficult to reach an exit if nature calls. Plus, the show does not have an intermission, and I guarantee you don’t want to miss any of the action! The call of the trumpet marks the beginning of the festivities. The King’s Chancellor serves as the Master of Ceremonies, and after welcoming you, will give instructions so everyone is seated in a timely, orderly manner. Once we arrived at our seats, our servers greeted us and before any food or drink was brought to the table, asked if there were any allergies or special dietary restrictions. Then the food and the fun began. The food was good, and each course arrived at regular intervals through the show. There is no silverware; you are expected to eat with your hands just as it would have been in true Medieval times. We began with a soup that was poured into a metal cup. While the soup was a pleasant temperature to drink, it did heat up the metal cup. Garlic bread arrived next and was inhaled by my kids. The main course followed and consisted of half a roasted chicken, corn on the cob and potatoes. There are vegetarian options available. The child and adult meals are exactly the same portions. Dessert was a tasty lemon cake and coffee for those that wanted it. Pepsi, Diet Pepsi and water are included and refilled throughout the meal. 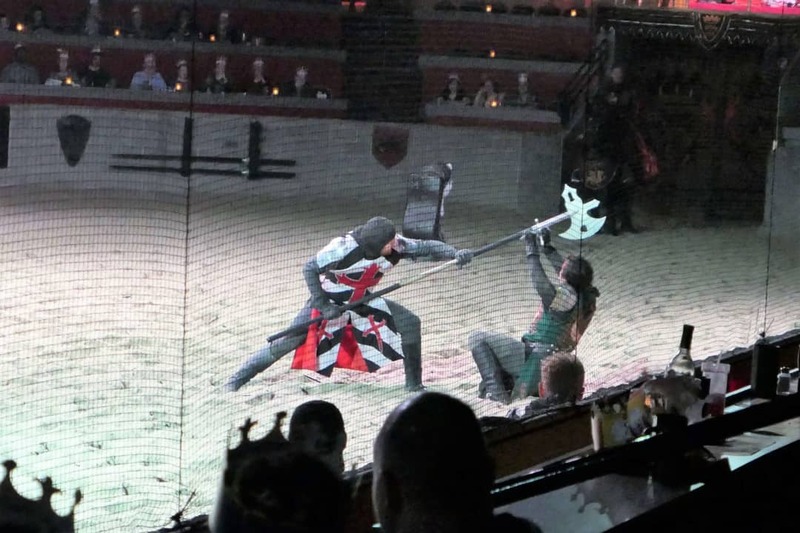 While the food is good, Medieval Times is all about the show. As guests of the King (and soon to be the Queen in 2018), six Knights compete in multiple tournament sports just for your entertainment. 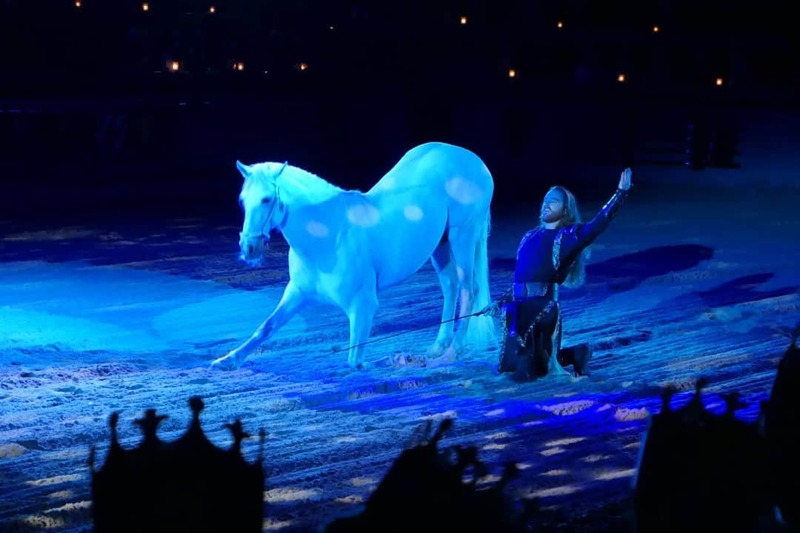 There are also several sections of the show where the horses display their remarkable talents, and there is even a falcon that flies through the stadium. The Knights were true showmen. It’s hard to find an activity that both my daughter and my thirteen year-old son enjoy, so I was happy to watch then both have a great and entertaining evening.